I love potatoes! I love them boiled, parsleyed, creamed, au gratin, french fried, country fried, baked, twice baked, puffed, scalloped and smashed and mashed (think Bubba from Forrest Gump describing shrimp when reading). Now I can add soup to the list! This low fat version of a classic is thick, creamy and absolutley delectable. I had zero guilt when eating this and it was even better as leftovers! Fuller fat versions of milk and cheese can always be substituted for a richer taste, but take my word for it, this lower fat version is just as good! Bon appetit! Remove skin from the potatoes and chop into 1 inch cubes. In a large dutch oven, saute onions and celery in a little bit of olive oil until the veggies begin to sweat but not brown. Stir in flour and butter and cook for 2 minutes. Slowly whisk in the stock until all is incorporated. Add diced potatoes and slowly add the milk. Once the milk is added simmer the mixture and stir occasionally. Cook soup over medium to low heat for about 30 minutes or until the potatoes are done. If you prefer a chunky soup serve as is, if a smoother soup is preferred, use a food processor, blender (regular or immersion) or potato masher for desired consistency. If using a food processor or blender, start with half of the soup first, then add to it if smoother consistency is desired. Top with store bought (real) bacon bits* and reduced fat cheddar cheese. RF Sour cream and scallions or chives would also be a rock star additions to this soup, but I didn't have any - shame, shame! *Instead of store bought bacon bits, you can also cook your own turkey/regular bacon and crumble on top, or discard altogether for a meatless meal. I hardly ever buy or fix bacon. I love it, but I don't love the way it makes our house smell for days afterwards, not to mention it's not very figure friendly. I usually tend to save my bacon eating for camping, but for the few recipes that do call for bacon, like the one listed above, a great shortcut is to have a bag of "real" bacon bits tucked away in the freezer. My mom got me hooked on these little nuggets and they are so convenient! 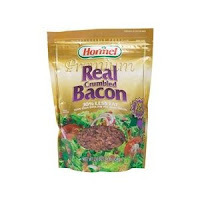 They are great added to regular baked potatoes, omelets or egg scrambles and even used to top a salad. Try some "real" ones today, the imitation bits just won't work!